The meet saw a welcome return to the Sail Mhor hostel at Dundonnell. On the way up on Friday, Tim bagged a couple of Corbetts, firstly Little Wyvis followed by Beinn Liath Mhor a Ghiubhais Li at Loch Glascarnoch. Martin ran up Meall a Buachaille on his way past Aviemore and Claire H ran up the Corbett Beinn a Bhathaich Ard at Strathfarrar. We awoke on Saturday morning to an unexpectedly beautiful sunrise and the anticipation of two penultimate Munro trips. It turned out to be a cracking day with great views all around, with the unlucky exception of clag & wind down in Torridon. 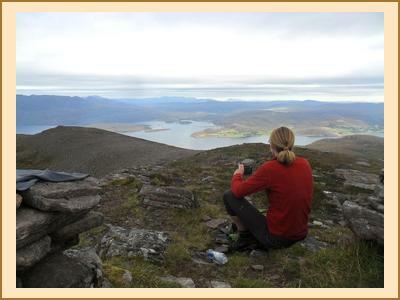 First off was Claire H, under a wee bit of pressure with Liathach still to climb before her final Munro trip in 7 days time, but Liathach was successfully bagged with Antti and a friend of Claire’s that met them down in Torridon. Under less pressure was Monty with nearly two months before his final Munro trip. Slioch was duly bagged with Clare A followed by a compulsory swim in Loch Maree afterwards. Martin and Philip headed up Sail Mhor from the hostel before climbing An Teallach via the West Ridge. 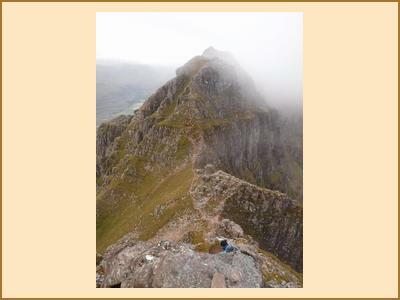 Emily and Marlene also climbed An Teallach starting from Corrie Hallie. Allan S, Emma, Gillian, Miriam and Kate climbed Cona Mheall and Beinn Dearg from Inverlael before following the massive wall down the ridge of Beinn Dearg and back across to Braemore Junction. Tim had another double Corbett bagging day with Beinn Enaiglair at Braemore Junction followed by Sail Mhor. Alan H had a windy day on the two Grahams Beinn Bheag and Groban at Loch a Bhraoin, heading past a deluxe bothy complete with flushing loo on the way there. With a target of 100 Corbetts in sight, Tim set off on Sunday to cycle into the incredibly remote Carn Ban before bagging Beinn a'Chaisteil on the way back out. Clare A climbed a rather boggy Am Faochagach and Alan H headed for the Graham Meall Doire Faid at Braemore Junction. Gillian, Emma, Allan S and Kate climbed Sail Mhor from the hostel and then traversed down and across to Gruinard Bay. Claire H, Martin and Antti had a surprisingly brutal ascent up Beinn Ghobhlach from the Scoraig path. A few of us stayed on at the hostel on Sunday evening with Emma, Allan S, Gillian and Kate climbing Am Faochagach on Monday by Martin’s excellent west ridge route with great views. Martin took in some of the coastal path towards Ben More Coigach before heading further north. Many thanks to everyone for another great meet at Sail Mhor and very well done to both Claire and Monty!